It was in 1896 that Ethiopian forces led by Emperor Menelik II had defeated an Italian army with better contemporary military technology at the Battle of Adwa. Subsequently, the victorious Emperor had brought in a range of technologies including railway to transform his country. For his triumph at Adwa and for his endeavor to change Ethiopia in his own ways, a statue in his honor was erected at the center of Addis Ababa called Arada. The statute of Emperor Menelik II in Addis Ababa, Ethiopia. Photo courtes of Abel Wabell. Almost forty years later, in 1935, the Italians launched a new but a prearranged military campaign endorsed by their then belligerent leaders. The Italians managed to have a brief military occupation of Ethiopia but faced a staunch resistance from Ethiopians. Pope Abune Petros, who was among the first Popes of Ethiopian Orthodox Church, was the leading figure of the resistance in Ethiopia. The Italians never liked what he was doing as a patriot and tried to stop him. He was forced to appear before General Rodolfo Graziani to submit and declare the Ethiopian patriots as bandits. He refused to comply with their demand and condemned the aggressors instead. He asked Ethiopians to struggle for their freedom. Finally, the Italians executed him in public. 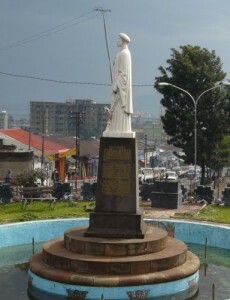 As it was done with Emperor Menelik II, a statue of Abune Petros was built at the center of Addis Ababa as reminiscent of his unwavering stand for his country. However, unconfirmed reports are circulating online that the two iconic statues found on an historical thoroughfare might get wrecked due to an Addid Ababa rail tunnel construction project. The reports have not been received well by some netizens. The statute of Pope Abune Petros in Addis Ababa, Ethiopia. Photo courtesy of Abel Wabell. 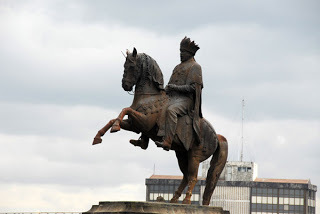 Will the Addis Ababa rail lines construction destroy the statues of Emperor Menelik II & martybishop Abune Petros? If the answer to this question is yes, our stance for the rail lines construction would be different! Our development should not come at the expense of the statues of forefathers of Ethiopia who have given their life for the country! There is a saying which says “Are you gossiping God while you give your weight for the soil!” What we put in for development should reflect on what we already have, it should not destroy what we have. We might need vehicles but the vehicles should not cut off our feet. Whether we like it or not Ethiopia is a country with rich history and heritage and these are foundations for our survival and continuation. 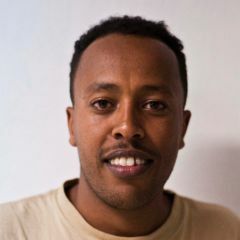 So constructing rail lines at the cost of Ethiopia’s iconic figures is like going to a barber shop for hair cut after amputating one’s head! The project group should think thrice before they decide to demolish these statutes. Destroying a figure of a man who had built the first railway in Ethiopia a century ago to construct rail lines is a complete sarcasm! Demolishing the statute of a man who had given his life for freedom of his country and wishing to commute freely on the train is an indulgence. While some Italians built a memorial to a Fascist military leader, there is a rumor that Ethiopians are set to demolish the iconic statues of Menelik II and Abune Petros! What an irony – this is the difference and this is the progress! What we are asking is “Why are these kinds of projects not preplanned? Why are the statues and historical places of our forefathers who have contributed a lot for Ethiopia not given due emphasis during planning? 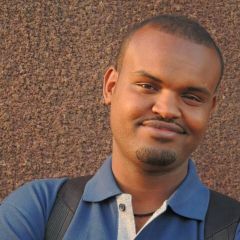 Or is there a conspiracy against Ethiopia’s history? This is the second time in a year that the Ethiopian government has sparked controversy involving a statue. Kwame Nkrumah's statue, which was unveiled at the African Union (AU) headquarters, which was built with help of the Chinese government, has also sparked anger amongst Ethiopians as many Ethiopians feel that the country's former leader Haile Selassie also deserved recognition. From their past evil actions and lies ,we can’t trust Weyane and his hodam authorities. As we know Radio Fana is working as a tool of fabricated lies means Weyane media and against justice and freedom of the Ethiopian people. As Weyane is the agent of Shaebia to destroy Ethiopia, that’s what they are doing now is their historical agenda. Their hodam authorities try to cool down the anger of the people. so go to hell, and trust trash lies as usual. we are eager to see our rail way.. Correction: the sentence “Pope Abune Petros, who was among the first Popes of Ethiopian Orthodox Church, was the leading figure of the resistance in Ethiopia.” should instead read “Bishop/ Abune Petros, who is one of the bishops of Ethiopia’s Orthodox Church, was the leading figure of the resistance in Ethiopia.” Ethiopia’s first Pope / Patriarch started in 1959 which is more than 15 years after the war with Italy. May Holy Trinity and the Saints bless Ethiopia. I have been hearing and reading in the past two weeks about this topic. However, I decided to do research before jumping to conclusion since the rumor run rampant among online communities fueled by overzealous news and blog sites which can drive their internet traffics to make more money. Every click makes brings some money. Also, it increases they popularity by drawing traffic. The bottom line is this topic does not have any merit. Without my judgement read the following article. there is no wonder that the ethiopian dictatorial rigime resume to do such a thing in our country historical statues.because even from the very begning up to now the woyane regime fully determened to destroy our culture and identity.every time the regime is keep doing to sabotage public properties and trying to distabilze the country by creating terror among citizens.every one can be a witness that now a days our contry is becoming the worst place to live as a human.the goverment always try to divert the peoples attention from the worst human right to some other events as usuall. Demolishing statues of historical figures for me is an act of crime …it is denying the coming generation’s right to know about their past. they began and evolved into what they are today and these statues are masterpieces reminding us who we were.